Update 10/05: After deep dive-in with Microsoft, it turned out some domains like GMail, Hotmail etc. are blocked. I was however able to sign up in the free Yammer network of abv.bg (which is a free email service provider in Bulgaria) and surprise, surprise - there were already 335 members! Update: It seems you can't invite external users to the external groups, unless they are existing Yammer users (e.g. they have a home Yammer network), which makes the service 50 % useless. 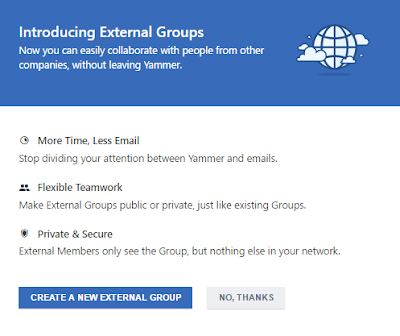 Starting today, we got a hold of the Yammer External Groups feature. I've already tested the feature and it works surprisingly well - the external groups are clearly listed as such below all the internal groups. When you invite someone, they get the email invite, join and only see the external group they're invited to. Nothing else. This is the experience for the external user when they join. They see your group along with the network name under their All Company group. With external networks, a Network Admin could configure whether those external groups could be created by all users or by the admins only. So far I don't see the option to control the external groups creation, but the regular users can't create them in our network. I can also see that the option to create an external network is now gone. So... enjoy the external groups and say goodbye to external networks. Good explanation, Yammer has now added additional feature where the control is 1) Requires admin approval for company members to join other companies external network but i have not understood the importance of other two options 2) disable the related external network directory 3) disable the external network directory and remove external network link in the networks menu.